I love all the fun seasonal items especially Halloween and Christmas products. One of my all time favorite over the years is seeing the Monsters Cereals by General Mills. This year they did an old school throw back and released their cereal in retro packaging. Have you seen them? I love all the halloween recipes ideas which I found in the Monster Bash Magazine at Target, too! The Monsters Cereal retro packaging can be found at Target! If you stop over at Grocery Savvy you can see all the products available at Target. The site is full of fun recipes, too. We made the Count Chocula Marshmallow Bars but didn't get a picture! My daughter needed them for school and had them bagged up before I could snap a few shots. Can you believe that? Here are a few of my favorite recipes from the site. 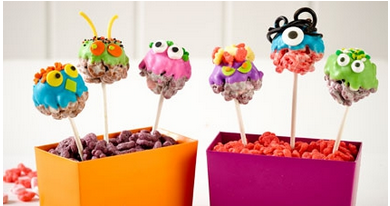 Monster Cereal Marshmallow Treat Pops - we are going to make some of these! 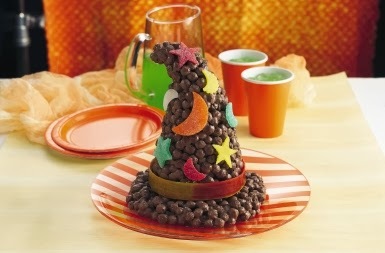 Chocolate Fudge Witch Hat - I always forget that marshmallow treats can be made into shapes! This is so fun and would be a cool centerpiece at any Halloween party. 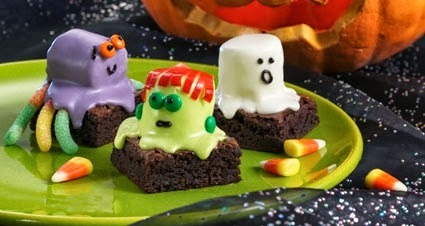 Spooky Brownies - This recipe doesn't use the Monster Cereals but isn't it fun? 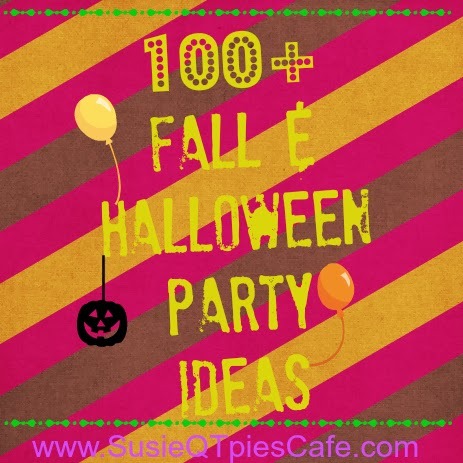 The kids could help make these for the party or even at the party as a food craft. When you buy three General Mills Monster Cereals in one trip to Target you will receive the free Monster Bash Magazine. It is full of tasty recipes, tips & tricks and fun, creepy, scary and spooky Halloween ideas for you and your kids to make together! Enter below in this quick giveaway for 3 Retro Boxes of Monsters Cereal and a $25 Target gift card. Ends 10/28/2012. In the fall I like to make carrot cake. From Grocery Savvy I like the Bacon and Egg Enchiladas recipe. I like how they have Target coupons. Thanks for the chance to enter. They have a whole recipe section. I like making apple cake, pumpkin cake, cookies, etc. I like making pumpkin pies for fall. There are a lot of cool recipes on the site, I love "The Count" Cupcakes recipe. I think it is great that they have gluten-free treat recipes! I like to make spicy carrot cake in autumn. My recipe is more like a bread, so no frosting is necessary, which makes it an everyday sort of indulgence. I have fond memories of Count Chocula--and the accompanying chocolate milk in the bowl. I found you need to register, lots of recipes and an insiders club. I left a comment on the Mexican Sweet Corn Cakes recipe post. Thanks for bringing back a favorite! General Mills Retro Monster Cereals are available only at Target®! Learned there is a great array of recipes. I make pumpkin crisp and pumpkin banana muffins and bread. The favorite cereal would be Count Chocula. I like to make halloween cupcakes, cake pops, and rice crispy treats! I love the recipes! I am gluten-free and I found some for me! I learned Nearly one half of all Americans dress up and/or decorate their house and yard for Halloween. I love all of the cute Halloween recipes! The Count cupcakes are my favorite! My favorite is Boo Berry, but I want to try Yummy Mummy, too! The recipes are really cool. My sons would love the count cupcakes. I like the boo berry. One thing I learned is that "nearly one half of all Americans dress up and/or decorate their house and yard for Halloween!" Franken Berry is my favorite monster cereal! I like to make sweet potato caserole during the fall.